One of my pet peeves has been circulating Facebook again since yesterday. So I dropped EVERYTHING I had to do this afternoon to write this post. Seriously. ALL afternoon. All these pictures didn’t make themselves. So please, dear friends, read it and take it to heart. 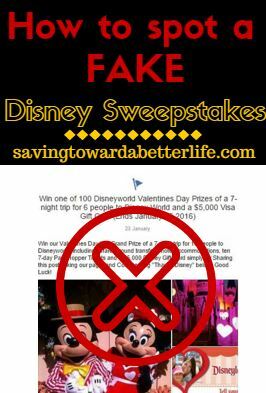 Be wary of fake Disney vacations sweepstakes and giveaways on Facebook! Disney will never give away a vacation via a Facebook page. Can I repeat that? Disney will NEVER GIVE AWAY A VACATION ON A FACEBOOK PAGE! Can I repeat it even larger? 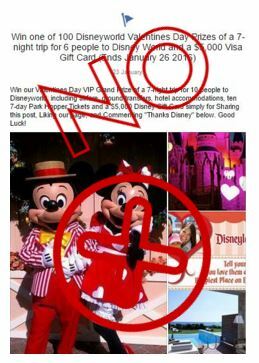 DISNEY WILL NEVER GIVEAWAY A VACATION ON A FACEBOOK PAGE! So let’s start with the most current one floating around…. Guess what? This “life event” on Facebook that it tells you to “like”, “comment” and “share” is NOT A DISNEY SWEEPSTAKES. But what about Facebook pages that look legit? They have the name, the logos, etc! Well, if you look close enough, they don’t look that legit. Only legitimate pages can use the proper name of the company. And just so you know it’s Walt Disney World (separate words) Disney Cruise Line and Disneyland (one word). Not Disneyworld, Disney Land, DisneyCruise. Also a period (.) at the end of the name (even if it’s spelled and spaced right) is a sign that it’s fake. Disney is not going to misspell, incorrectly space or erroneously punctuate it’s names. If there are no posts on the page – or the giveaway post is the only one – FAKE PAGE! Disney is very active on social media. They will have posts! 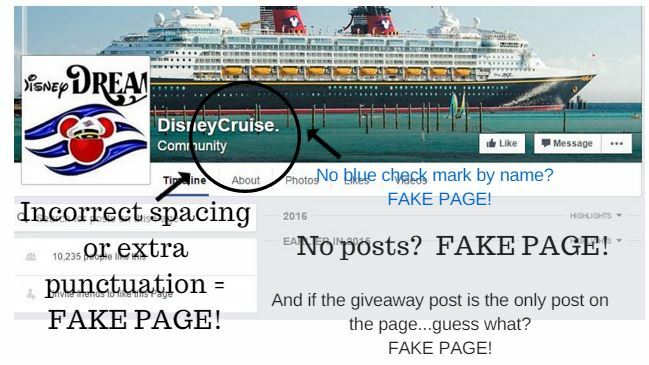 The reason the cruise page example above has 10,000+ people that “like” it and no posts is that after it posts a giveaway and gets people to like the page, it deletes the posts. 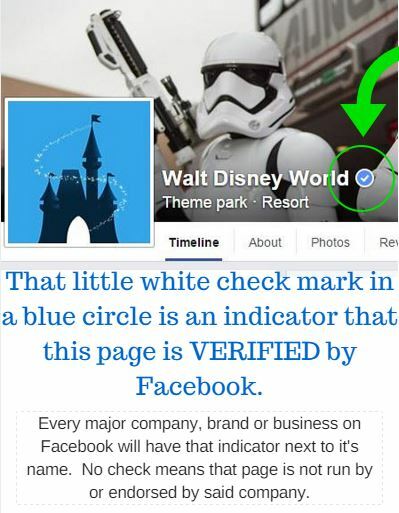 This one even has a what appears to be “real-time comments” including a comment from the Walt Disney World facebook page with the blue and white verification checkmark. Only problem is this is not a “real-time comments” feed. It’s an image. In a real time feed I should be able to click on “Walt Disney World” and it take me to their page. This one does nothing. They made a PICTURE to make it look like the comment came from a legit Disney page. Even though the giveaway at http://disney.magicyourway.club/rsvp/pelts600 isn’t ON a Facebook page, it still is requiring social media shares to get your tickets and it doesn’t not take you to a real Disney.COM site to enter. Disney.CLUB is not a legit site. So even though this is a new “style” of scam – requiring the social media shares still should fire off red flags all over the palce. Now I said all that but really, the only thing I should have to say is look for is the blue and white check mark. Really, nothing else should matter because the blue and white check mark says it all. That means that the page has been verified by Facebook as legitimately being who/what they are claiming to be. That’s really all that should matter. Just look for the mark. No mark – no good. Stay away. The top one is a fake page the bottom one is the legitimate page. Do we have it now? Ok, so WHY? WHY do people make fake pages, post giveaways they never intend to make good on and get thousands of people to like, comment and share? Quite simple actually, bait and switch for a profit. Imagine a person, we will call him Scammer Joe, has a page that 10,000 or more people like. And Skeezy Bob wants to advertise something (most likely something scammy or skeezy). Scammer Joe will sell his 10K+ fan page (something that cost him nothing to make and nothing to advertise because thousands of people advertised it for free!) to Skeezy Bob for money. Now Skeezy Bob wipes it clean, changes the name and puts his own stuff on it. Have you ever had something pop up on your Facebook newsfeed from a page you are pretty sure you never would have liked? You were a victim of a bait and switch. A page that you DID like sold to someone else and the someone else took over, changing everything. Have you (or someone you know) ever had a dummy profile made where someone took your (or their) picture and name and made a profile and started friending all your/their friends? Have you every wonder WHY you (or them) were targeted by the scammers? I refer you to Scammer Joe and Skeezy Bob. They have these pages that thousands of people like. What happens when you like a page? That page can see your profile picture and name (even if your posts are private – they can still see those two things). It’s like going fishing in an aquarium. Right in front of them is a list of “easy prey”. 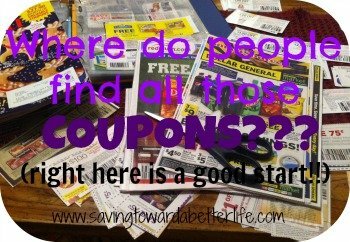 I hope this post has been helpful and that you will pay a little closer attention before you share things on Facebook. Here are the ONLY LEGITIMATE Disney Parks Facebook Pages. Go like them now! Follow Disney World on Facebook. 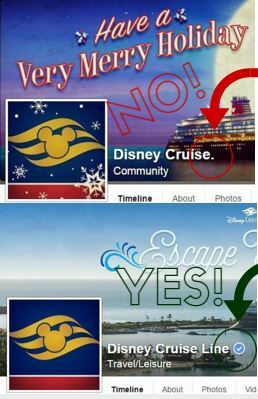 Follow Disney Cruise Lines on Facebook.